You are here: Home / Uncategorized / Patience rewarded–The Buddha in Hell is on Amazon! You thought I was kidding! 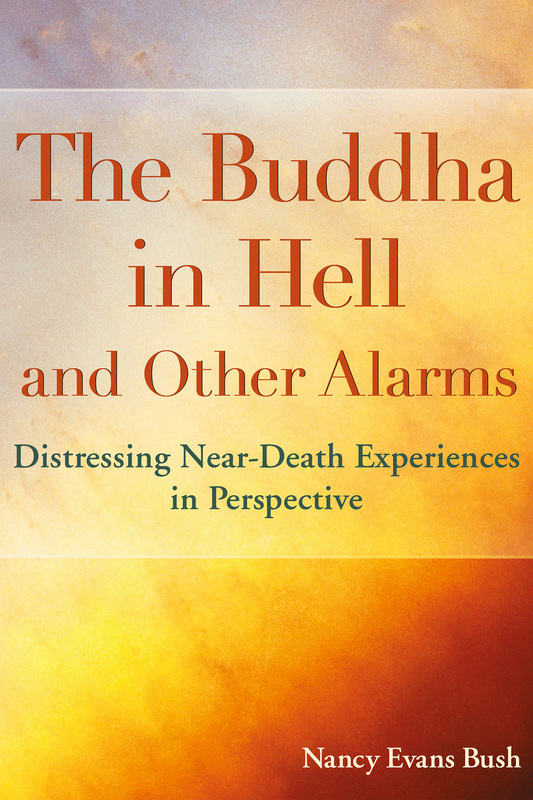 Well, the hot news is that the Kindle version of The Buddha in Hell and Other Alarms has just gone up on Amazon in the U.S. Whereas I think of Dancing Past the Dark as a comprehensive overview of distressing NDEs, this second book is more evaluative. Its tone is more conversational and personal, as befits a creation built from rewritten blog posts of the past four years, unpublished writings, conference presentations, and articles from guest authors. If Dancing is a roast, The Buddha is a casserole. You can check it out at Amazon, even read a sample. Within the next two to four weeks–as soon as the distributor gets word out to to major international retail outlets–the non-Kindle ebooks will be available pretty much wherever digital books are sold, followed by the paperback version, due out also within the next month. List price of the ebook is $9.99 USD and paperback $16.95, but if you wait for discounting to take place the price will go down. Once you’ve read it, please do leave a review! With no budget for marketing, the book will get by with a little word-of-mouth help from its friends. As always, you can also feel free (please!) to come here to ask question or make comments. Woohoo! I’ve been checking and checking. I saw you were on the schedule at the IANDS conference, so that was reassuring. I am resisting digital books still, so I’ll be getting the paperback. Congratulations, Nan! Thanks for letting me know Nan. I am looking forward to another informed and revealing read. Brendan, thanks. Let me know what you think. It’s very different from the first book. Congratulations. Surely is a masterpiece, I wish You the greatest success. Thanks so much for your support, Guillermo. Nice to hear from you again. I find this Info. Interesting? Yes. Info. Interesting? That says it. Just finished the book. I just want to say thank you for your research, thoughtfulness, and introspection. I have not personally had an nde, but I’m just so grateful that you shared yours and opened up this topic. I also read Dancing Past the Dark. These works are so important because they give people hope! If anyone would have a good reason to place their nde in the category of “not real”, it would be you. But instead, you came to the hard work of tackling this topic, being brave, and trying to gain insight. This benefits all of us, no matter where we are in understanding. That has helped me personally in so many, many ways! Again, thank you. Bless you! Your words are both kind and reorienting. I am trying to get back to doing an occasional blog post. 2016 has been chaotic in a number of ways, all of which have interfered with both intentions and work. But now–happy New Year! And thank you. I’m so glad to see new comments up! I was worried about you, but now I’m hoping you were taking a recuperative break. I put my review up on Amazon under the name Jude Dee. I was very, very impressed with both your books. They have been so insightful for me. Thank you for the dedicated work you have done and continue to do! Your analysis of the historical origins of The Bible is something I’ve needed for a long time. I’ve shunned organized religion and the Bible all my life like the plague…..on instinct. In reading the Buddha in Hell, and learning about its origins and the ways it was manipulated to establish control, I finally have a way to learn from it. I’ve lived my entire life “steering” around it, looking for spiritual understanding elsewhere. I’ve lost track of how many ‘thank you’s’ I have sent you. This is another of them. So, who goes after myself as I am more ready to take lead? I’m a preverbal mixed and THESE EXPERIEMCES HAVE BEEN MIXED, no matter how we explain them. Are we going to waste more time? For those who haven’t seen your earlier posts, Jill, will you explain what you mean by ‘a preverbal mixed’? NDEs are, have been and will always be mixed; I’m not being mean for being a Pre-verbal Mixed! Patience is not one of my virtues. As a preverbal mixed, I grab treasure and go, knowing these treasures will be appreciated in the future. What has created such a silence here? Is it because Donald Trump is our new president? I’ve told one of my two sisters that their million women March will be better served as charity to single mothers raising children. My single mother friends ask, are your sisters willing to do this for us? Absence of patience notwithstanding, thanks for hanging in. It’s been a chaotic year all over, including here. As for the March, for what seemed like a great many years, it was my chief ambition to survive single motherhood; I am sympathetic to your comment. More patience. I’m a preverbal mixed from the late 1950s and am not just hanging around. … The catastrophes happened and what pleasantly surprised me is what strides we’ve made. Just received the new book, seems to be an accessible presentations of difficult concepts, a welcome antidote to the literal mindset of the times. It seems a persistent human tendency to turn symbol and metaphor into stone, and you remind us of the hidden thread throughout religious history that sought the numinous in the midst of institutional dogmatic insistence. So now we endure versions of dogmatic insistence today on both sides of the religious/atheistic coin. It’s lonely for one who read Alan Watt’s “Behold the Spirit” 40+ years ago, who was introduced to Carl Jung by a Carmelite priest, to get through all that concrete when trying to dialogue with other of the desire for G-d, or some semblance of meaning in all this…..suffering and conflict. But there have always been guides, and your writing is one. If only we understood that when we try to capture the Wind, it dies. But I too cling for dear life onto a handhold – I insist that it must be the “true” nature of Reality, is the hope that the Fall of The Sparrow means every living thing is “seen” – eternally and deeply beloved. Oh…and this lifelong handhold: the possibility of transcendence, of being “far-reaching and nameless”, which is all I ever really wanted – but always, always left behind as It passes by after the barest glimpse of it. Oh well. An “earthbound misfit” wanting to fly as Pink Floyd so gorgeously put it to music in (what else?) “Learning To Fly”. It seems one lifetime contains too much tiresome experience, but little “progress” in Spirit. I suppose the existential despair of the human condition is our inescapable limitation – “how small this is, with which we wrestle, what wrestles with us, how immense” from Rilke’s “The Man Watching, Book of Images, Translated by Edward Snow, page 211, to experience the “farreaching and nameless”. I sure hope there is something that makes this all worthwhile after death. Carolyn, what can I say? I wish you were within hugging range–and bless you numberless times for the mention of Alan Watts! We are all ‘earthbound misfits,’ perhaps, though some of us seem more highly allergic than others to the human condition. My years-long suggestion to myself has been to deliberately search for the balance points–to restrain my inclination to go haring off down the all-too-obvious dark passageways or the temptation to spiritual grandiosity, and to find and rejoice in small gladnesses, which are equally abundant. Thank heaven for the Rilkes who come to us! I have found that relaxing into my smallness makes that wrestling feel more poignant and less diminishing; somehow, there is a kind of transcendence in the acceptance. At least, it works for me. Please stay in touch! I’m a preverbal mixed experiencer from the late 1950s, who has learned to share blessings. Isn’t that sharing a great gift! At least, I hope you find it so. I just checked the Amazon site for Buddha in Hell and saw that my review–written and posted late last year or early this one–is not there! I don’t know what happened. Would it be of use to you if I tried again with a very short 5-star review now? Judy–It’s worth a try! Thanks so much for your effort. I appreciate it! Nancy, I was mistaken. For some reason, Amazon has separated the Kindle reviews from the print reviews. My review (Jude Dee) is still there with the print reviews. Both your books are so important. I hope and pray they will come to the attention of all who need their wisdom. Richard, saying there is no Hell for Hitler would be way above my pay grade! What I can say is that there are many reasons to keep in mind the limitations of our human ability to understand God’s mercy. This is not to suggest that a Hitler gets off scot-free, but that our narrow, human desires for endless vengeance and retribution are probably not the only responses God has available. I suspect that, as one’s actions are revealed to oneself as the pathologies they are, the realization of the consequences of our actions may be as excruciating as hellfire. Human understanding looks for an explanation of the evil people do, but seeks resolution in justice, the cry to Heaven of the weak against the strong. I don’t believe any human acts out of full conscience self-awareness, not even the monsters among us, even as there is no excuse for extreme cruelty. If G-d’s mercy is ultimately concerned with healing between the armed and the harmed, Hitler and many others…may or may not be except from Mercy. Some of us prefer justice as eternal punishment for such crimes, others of us prefer the resolution of universal redemption. I’m hoping for G-d’s incomprehensible mercy than eternal torture. But nobody knows how Evil might be transformed outside time…perhaps its practitioners simply ceases to exist. Carolyn, many thanks for your thoughtful response. Mystery stands all around us, no matter how fiercely we demand solutions to fit the shape of our beliefs. Finally, got around to buying the paperback of this, what an excellent colection of essays, and much needed in this world of dogmatic standpoints that we have someone like you that provides food for thought without trying to convince the reader of one true path. I came to your blog years ago not because I had a NDE but because I had some heart issues that sent me to hospital and the sudden realisation of my own mortality scared the life out of me and after doing some spiritual searching was just starting to get settled again when I came across Howard Storm’s NDE. Luckily I then came across you and your blog. I wouldn’t say I’m yet totally 100% comfortable with my mortality nor what happens after but I am very much in a better place these days. Interestingly the kind of experience I had while not an NDE has many of the same stages to go through as a distressing NDE or a heros journey as I was shaken out of my comfortable old life into a place of fear, confusion and challenge so I find your steps from the first book have some resonance not just with dNDErs but I think with anyone facing a difficult life event that challenges them spiritually. I’ll say more about the new book when I have had time to take it in but just wanted to say thank you. I hope you are able to return to writing blog posts at some point. One interesting thing I always wondered is how can we suffer physically in a hellish NDE if we are out of our body? I can understand emotional torment happening but not physical. I got thinking about this when reading “Eric” by Terry Pratchett which is a humourous parody of Faust. In it the new head demon of hell has changed from physical torments to things like reading the health and safety regulations for pushing a stone up a hill (several thousand volumes of them!) rather than pushing the stone only for it to roll back. Jon, I hope you got my email! LOL. I don’t look, so can’t tell you what to expect. Hope you enjoy. The link I’m sharing is Nancy Evens Bush – The Buddha in Hell: When Spiritually Transformative is Confounding, an IANDS video on YouTube. I enjoyed watching this video and think it’s worth sharing. Omigosh, yes! Thanks so much. Testing, testing… Is anyone still interested? Echo responds. Still interested, of course, but not as active as age advances. Hoping for one more (short) book. Is there still enough interest, do you think, for intermittent blogging? You’re twisting my arm… 🙂 Happy Solstice and whatever transition/transformation may be going on in your life. Carolyn (and whoever else is interested), keep after me, if you will. It is so easy to become over-involved with the local community and church responsibilities–I need help remembering to leave space for the NDE challenges! A new year is upon us. Let me try to mend my attention. Thanks!